Dell offers the latest technology, including laptops, touch screen PCs, desktops, servers, storage, monitors, gaming and accessories, and more. As a benefit of active membership, Phi Kappa Phi members have access to the Dell Member Purchase Program, which offers discounts up to 35% on select laptops and desktops, plus hundreds of electronics and accessories. On April 23, members will be able to save an extra 10% off all Dell PCs and electronics sitewide. The sale starts at 8 a.m. E.T. on the 23rd and will last for 24 hours only. Visit the Dell Member Purchase Store at www.Dell.com/PhiKappaPhi to shop online. Please note, discounts are automatically calculated in the purchase price and will appear in red at checkout. Dell customer service and technical support are available through Dell's toll-free support line 24 hours a day, seven days a week, at 1.800.695.8133. Dell does NOT ship directly to the Philippines. Share Your Initiation Photos and Win! We want to see your initiation photos! Share a photo from your initiation ceremony on Twitter or Instagram on or before April 30 to be entered for a chance to win a customizable Church Hill Classics frame to display your membership certificate. 1. Post a photo from your initiation ceremony on Twitter or Instagram between March 12 and April 30. 2. Tag @PhiKappaPhi and use #PhiKappaPhi. 3. Make sure you're following @PhiKappaPhi on Twitter and Instagram. The national office will select one winner at random from all eligible photos to receive a customizable Church Hill Classics frame of up to $150 value. Visit www.PhiKappaPhi.org/Photo-Contest for more information, including official rules. Questions? Contact Marla Elsea at melsea@phikappaphi.org. As of April 10, Shoeboxed has discontinued their partnership with the Society. As a result, members are no longer eligible for a discount from Shoeboxed. Members are encouraged to take advantage of the discounts offered by other Phi Kappa Phi partners. Visit www.PhiKappaPhi.org/Benefits to access all available member discounts. Questions? Contact Jamie Chapman at jchapman@phikappaphi.org or 800.804.9880, extension 217. The Honor Society of Phi Kappa Phi, the nation’s oldest and most selective all-discipline collegiate honor society, today announced the publication of its 2018 Annual Report. 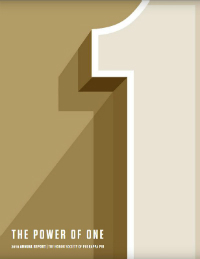 The report, themed The Power of One, showcases a number of achievements of the past year made possible through the generosity of donors to the Phi Kappa Phi Foundation. Because of this generous support, the Society continues to refine the role we play in recognizing and promoting academic excellence. “The generosity of our donors makes Phi Kappa Phi’s growing awards programs possible. We are enormously grateful for their commitment to the mission of the Society and for sharing their love of learning through their gifts to the Foundation,” Society Executive Director Dr. Mary Todd said. This year’s report features a stunning design with photos and infographics, stories of Phi Kappa Phi award winners and members, chapter happenings and much more. 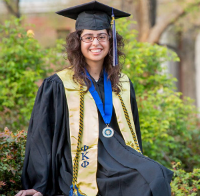 Stories and testimonials from winners of Phi Kappa Phi awards, including some awards given for the first time. The story of two generations of Phi Kappa Phi initiates at three universities. Highlights from the 2018 convention. Details about the winner of the $100,000 Excellence in Innovation Award. Listing of donors to the Phi Kappa Phi Foundation. To read the 2018 Annual Report, visit http://www.phikappaphi.org/annualreport. Order Your Grad Regalia Today! Calling all graduates! Show your Phi Kappa Phi pride during your commencement with Society-branded graduation regalia. Honor stoles, cords and the Phi Kappa Phi medallion are available for individual purchase, or save when you buy all three for $51.50 and receive a free tassel! Plus, members can take advantage of free shipping on orders of $50 or more. Click here to shop today! Please note, graduation recognition items are available to members only. You will be asked to enter your 8-digit Phi Kappa Phi member ID to validate your purchase. Your member ID can be found on your membership card, in the top right corner of the monthly Focus email and above your mailing address on the back cover of the Phi Kappa Phi Forum magazine. Protocol for wearing graduation recognition items varies from school to school, and we recommend checking with your college or university before ordering. Questions? Contact Jamie Chapman at jchapman@phikappaphi.org or 1.800.804.9880, extension 217. In honor of National Volunteer Week, Phi Kappa Phi celebrates the outstanding efforts of its board members, committee members and chapter officers who serve more than 320 chapters nationwide. The commitment and support of these volunteers enable Phi Kappa Phi to continue its almost 125-year history of recognizing and promoting academic excellence in all fields of higher education. National Volunteer Week was established in 1974 as a way to recognize and thank volunteers who lend their time, talent, voice and support to causes they care about in their communities. To learn more about volunteer opportunities available for Phi Kappa Phi members, visit www.phikappaphi.org/volunteer. The bad news, you can’t access exclusive member savings. The good news, it’s April Fools’ Day! Skip the pranks and start saving with these deals available only to active members throughout April. You’ve earned it. Frame it! Customize a frame for your membership certificate from Phi Kappa Phi partner Church Hill Classics. You can choose from a variety of frame mouldings, mat colors and materials to create a frame that complements your home or office decor. In addition, you can find a frame to showcase your medallion, stole and initiation photos! Click here to start designing today! Did you know that you could save up to 8% on your auto insurance with GEICO? That’s right! Phi Kappa Phi members can access an exclusive member discount, and free auto and homeowners quotes. Visit www.GEICO.com/PhiKappaPhi to get your free no-obligation quote today, and each time you request a quote GEICO will make a contribution to the Society in support of our awards programs. Existing GEICO customers could also qualify for the discount. Receive up to 60% off select Lenovo technology products, including ThinkPad, IdeaPad, Yoga, and Legion, throughout April. Visit www.Lenovo.com/PhiKappaPhi to shop Lenovo’s product line of PCs, workstations, tablets, smart phones and more, and click here to access exclusive monthly offers. Guard yourself from identity theft and save 10% on your first year of comprehensive identity theft protection with LifeLock. Click here to choose from the Standard, Advantage or Ultimate Plus plans and start your LifeLock membership today. Use promo code PKPOFFER if prompted. Members can now save 40% on a one year Sam’s Club membership through Phi Kappa Phi partner, MemberDeals! Click here to sign up and receive your membership activation voucher by email, along with a $5 Sam’s Club gift card and a second complimentary Sam's Club membership card. Are you graduating soon? If so, don’t miss your chance to show your Phi Kappa Phi pride during your commencement with Society-branded graduation regalia. Honor stoles, cords and the Phi Kappa Phi medallion are available for individual purchase, or save when you buy all three for $51.50 and receive a free tassel! Plus, take advantage of free shipping on orders of $50 or more. Click here to shop today! Are you looking to dust off your résumé? Our partner Seeking Success can help, and you can save $75 on all available writing packages. Click here to view available resources and writing packages, and use code PKP2015 to get started. As a benefit of membership, you have access even more savings year round at PhiKappaPhi.org/Discounts. Please note, discounts are reserved for active members, and your member login will be required to access many of the webpages listed above. If you need assistance with your login credentials, email webmaster@phikappaphi.org. Questions about member benefits? Contact Jamie Chapman at jchapman@phikappaphi.org or 1.800.804.9880, extension 217.